When the weather gets yucky, confirmed weather wimps like me huddle indoors, trying to stay warm. Even you mysterious folks who enjoy being out in the cold eventually head back inside to a warm fire, comfort food and familiar routines, right? But while we’re huddling, creativity can snuggle under a warm blanket, too, content to hide until spring. So what’s a creative person to do? How do we spark creativity during this darkest, coldest time of year? My solution? Go out and experience something new. 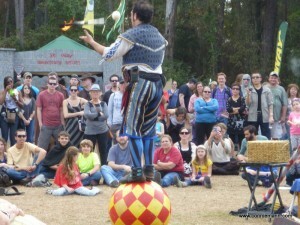 This past weekend, I found inspiration in a place I hadn’t expected: The 28th Annual Hoggetowne Medieval Faire in Gainesville, FL. We’d never been before, but excitement hovered in the air as young and old converged on the ticket booths. For a people-watcher like me, that’s where the fun started, ogling the costumes worn by a surprising number of festival-goers. The interpretations of medieval attire went from elaborate silks and satins to the truly ridiculous, with everything in between. I felt under-dressed in my sweater and jeans and thought I should be wearing a hooded cape, at least. Entering the festival definitely felt like entering another world, though I’m not sure it was the knight’s realm, exactly. We were heckled by stilt-walkers, made fun of by jesters and greeted by the King and Queen during their procession through the streets. We watched fencing demonstrations and cheered our favorite knight during the Tournament, disappointed when he didn’t win. The potter gave a wonderful demonstration, and we really enjoyed watching the glass blower, too. We got a lesson on how to card wool (so glad we don’t have to do that anymore), saw coins stamped into jewelry, watched a weaver and strolled the eclectic array of shops. Where else could you buy jewelry, soap, candles–and a potion bottle, complete with leather strap to hang on your belt? 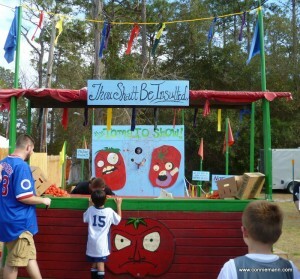 We declined the elephant and camel rides, but laughed ourselves silly watching the tomato toss. I would go again, but I would recommend leaving young children at home. Besides the costumes and occasional odd display, there was an abundance of ale, so the atmosphere deteriorated as the day progressed. How about you? Have you found some unexpected ways to ignite your creativity lately? I’d love to hear about it. PS–Don’t miss next week’s post, when bestselling author Sharon Sala will be my guest. One lucky person will also win a copy of Sharon’s new book, The Curl Up & Dye. See you then! 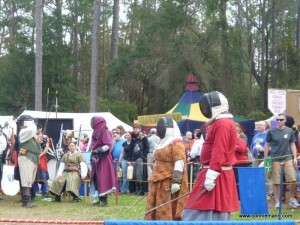 I’ve been to the Medieval Faire a few times. It’s a nice way to escape from the modern day. I find visiting different areas, meeting people from other countries, learning their customs, reading old reference material and new books spark my creativity. 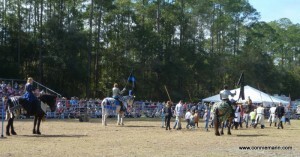 I attended a like fair year before last and yes, it was fun. I laughed often, which I think is key to creativity. When I’m feeling bedraggled, blocked or blue, I put on a romantic comedy and feel better almost at once. I totally agree, Ashantay! Laughter is one of the best cures–for all sorts of things! We laughed quite a bit at the faire and it felt good! 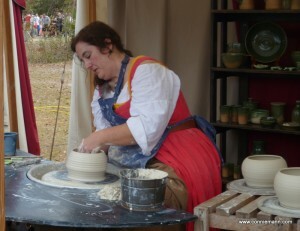 I’ve often wanted to go to a faire, but I tend to be put off by anachronisms. It does sound like fun, though, so I’ll try it someday. When I get a case of creative constipation, I go for a walk. Since my “walks” usually involve hiking boots or snowshoes, they’re a complete change of location and outlook. The fresh air and physical effort always help me find something new to think/write about. Thanks for sharing the fun and great pictures! Hi Jan, that historic district sounds like lots of fun–and just the place to find inspiration! Glad you two got to take that trip together!